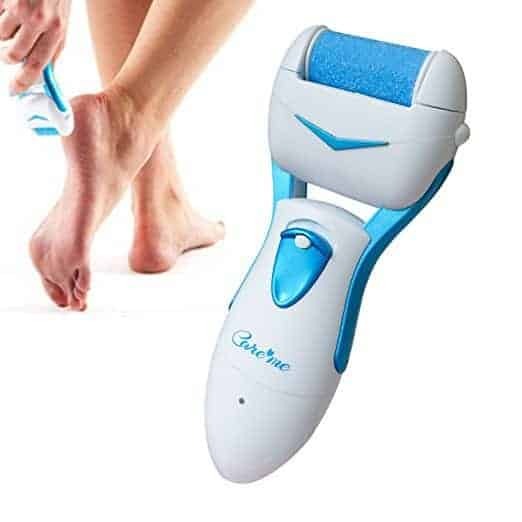 Callus shavers or foot scrubbers are handy little devices that will make your feet much smoother and more beautiful looking with a minimal amount of cost and effort. If you are tired of spending hours using a pumice stone to remove calluses and dry cracked skin, an electric callus remover is worth a try. They are inexpensive, fast and painless to use, and will give you similar results to what you would get from a profession pedicure, but without the high cost. Shopping for one of these callus removers can be confusing, as they all kind of look the same and have very similar features, making it hard to figure out which is the best product to buy. To help you find the best electric callus remover to suit your needs, we have compared a few of the top sellers to help you narrow down your search. Pros: It is a powerful rechargeable model that has a nice full design, so it is easy to grip and to use. 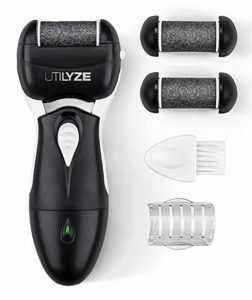 It comes with an excellent rechargeable battery, and large convex-curved rollers, so you treat a large area quickly. It also uses pressure-sensitive technology that helps to stop your skin from getting irritated. It uses a 360-degree quartz micro mineral crystals roller that rotates at 50x per second. You can use it for about 45 minutes on one charge. Cons: Some users would prefer a coarser option on the roller so it would work faster. 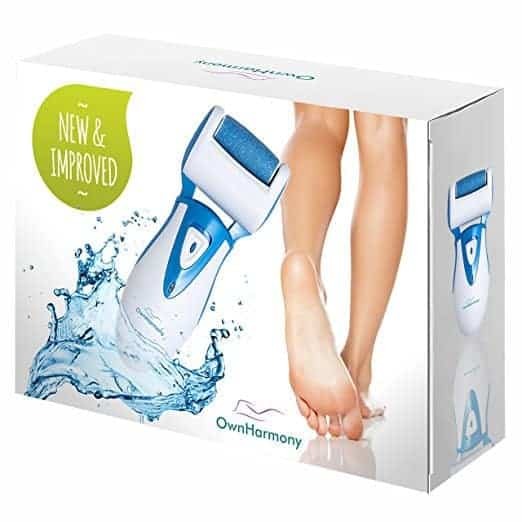 If you are looking for an inexpensive, good quality option that is going to get the job done you are going to want to get the Own Harmony Electric Callus Remover. It is one of the best selling options as it seems to work wonders for a lot of people. It is robust, inexpensive and reliable. It also has a very long rechargeable battery life of 750 hours. Pros: This Care Me device is another good rechargeable option that does a good job cutting through thick calluses. It has a nice wide design, so it is easy to grip and to use. This device comes with a replacement roller and a brush, and it is easy to order more rollers if needed. It is also easy to clean by running the head of the unit under water. Cons: Some users don’t find it to be powerful enough for their needs. It is an excellent option if you are looking for a basic mid-range model. It spins at 40 turns per second and has the choice of two speeds, which is an important feature to have in case you have sensitive skin and find the higher rate to be too much for you. To clean it you rinse it after you use it. Pros: This device oscillates laterally at 20 times per second. It uses a soft and flexible roller that adjusts well to the skin that comes in 4 versions (gentle/sensitive, normal/classic, extra and extremely coarse) so you can get more customized results depending on what your needs are. Since it is corded, you won’t lose power as you can with battery operated options. Cons: Some feels the rollers run out too quickly. Emjoi is a great brand for a variety of different types of callus removers. 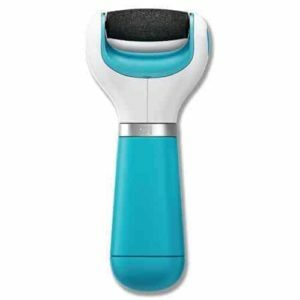 This particular model is the Emjoi Micro-Pedi 3D POWER Callus Remover, and it is one of their most powerful. It is an excellent choice to help smooth out your feet. Pros: Very powerful and quiet to use. Cons: It comes with two extra coarse rollers only, that may end up being too harsh for some customers. The UTILYZE foot file is a quality option that would make a lovely gift since the packaging, and the design is pretty slick. It is rechargeable but does come with an AC cord so you never have to worry about replacing batteries you can plug it in the socket to charge it. You are also able to use it while it is plugged in, in case you have forgotten to recharge it. Overall, customers love this product and recommend it pretty highly, especially for those who need a heavy-duty machine. Pros: This is one of the world best-selling callus shavers. People love it because it is inexpensive, it works well, and it is easy to find in stores. Cons: It only comes with one roller; you have to purchase an additional refill roller. It runs on AA batteries and can be a bit of a power hog, so you may end up buying A LOT of batteries. The Pedi Perfect is by far the most popular electric callus remover around. Its success has been feeding itself despite some issues with the power of the motor and the reliability of the product. However, for the low price, it gives the customer what they want, which is a smooth callus free foot. How is it powered? There are three options: it will have a cord that plugs in, and you use it while it is plugged in, it will come with some rechargeable batteries, or it will use standard (probably) AA batteries. If you have to replace the battery, you may want to include that when you consider the price of a particular model. Is it water-resistant? Can it be used in the shower? Most of the best-selling products are water-resistant, meaning that you can clean them under a tap, but you don’t want to submerge the unit entirely in water or use them in the shower. If you are looking for something waterproof that you can use in the shower, there are a couple of products on the market that are waterproof. Check out PediBunny and Ckeyin, although keep in mind most shavers work best if your feet are dry (think about wet sandpaper). How strong is the motor? The stronger the motor, the better the shaver will work. When you are shaving off the calluses, you gently touch the device into your skin. Some users complain that certain shavers stop working when you apply too much pressure because the motor isn’t strong enough, but you have to remember that you shouldn’t be pressing the device down on your skin too hard. If your calluses are tough, look at the RPM of the motor of any product you are considering. What is the material on the roller? How many rollers does it come with? Everyone has different needs for their feet and different sensitivities, so you may want to ensure you get a product that will allow you to change the roller to something other than the standard roller that comes with the device. 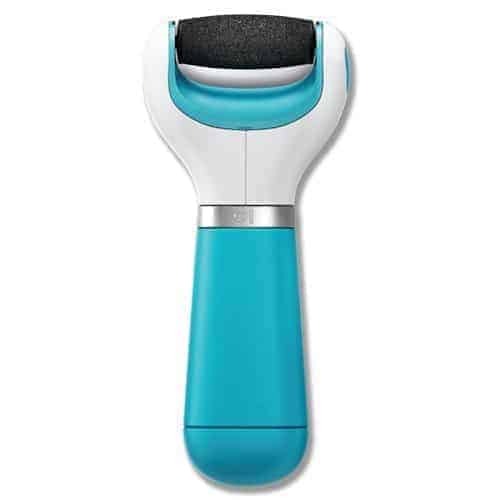 The company Emjoi lets you buy extra rollers that are regular, course, super course, extreme course, and they even have elbow exfoliation roller that you can use with your callus shavers on your elbows. How often do you have to replace the roller? For pretty much all of these units, you will have to replace the rollers at some point. It isn’t usually costly, but depending on how much you use it, the rollers will wear out (kind of like sandpaper or nail files). Is it easy to clean? No one wants a product that is going to be a pain to clean. For the most part, these shavers are very easy to wash, you either remove the head and rinse under cold water, clean the rollers under cold water or use a cleaning brush that comes with the set. Price Think about how much are you willing to spend. These products range in from around $20 to almost $100 for a professional quality shaver. If you are looking for a good, high-quality callus remover without all the bells and whistles, expect to pay between $30-$40. Where do you Buy Electric Callus Removers? You can get them at most big retailers, including Walmart, Target, Walgreen, etc. 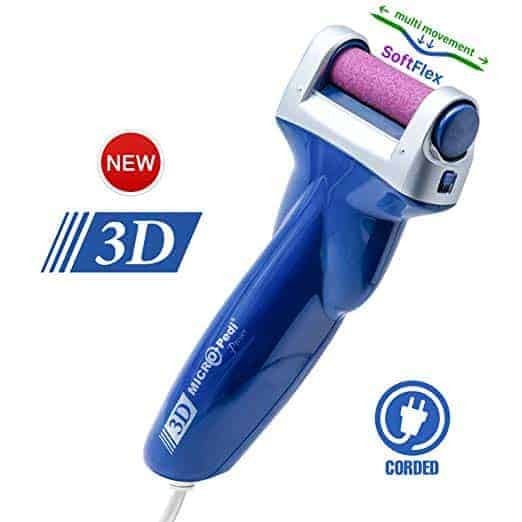 Most major drugstores will also stock some models, most likely the Amopé Pedi Perfect Electronic Pedicure Foot File, I’ve seen that one all over the place. Of course, you can buy them online through sites like eBay or Amazon, as well as directly from some of the manufacturers. If you are buying online remember to pay close attention to the return policy in case you end up with a defective product. Also, make sure you check shipping rates and times. Having dry and cracked feet can be painful and embarrassing, and not everyone has the time or the budget to get regular pedicures to keep their feet looking tip-top. Callus shavers are a good, inexpensive option to help get rid of unsightly, dry skin on your feet for a very low-cost. They are easy to use, don’t hurt and you can use them in the privacy of your own home.